Scores of people talk about leadership and its benefits, but few mention the obstacles that leaders face. Jennifer Bridges, PMP, discusses common leadership challenges, what the role looks like to the team and the larger organization, and how one must constantly adjust in order to succeed. Jennifer began by asking, “What does a leader do?” The obvious answer is that a leader leads a group of people towards achieving a common goal. But that does little to explain how a leader actually accomplishes that. How Does a Leader Lead? Motivate: If a leader can’t get people to be proactive, then a leader isn’t leading. Inspire: Ordering someone to do something rarely works, but if you can inspire them, they’ll follow you anywhere. Encourage: In a sense, leaders are like coaches who know when to inspire and motivate or when to support and encourage. Support: That support is multidimensional, ranging from emotional support to providing the tools they need to do their job. Guide: Leaders are in front, clearing a path and guiding those who follow to success. Leadership vs. Management: People often confuse the two, or praise one while dismissing the other. So when deciding between being a leader vs manager, the truth is both roles are crucial. Lack of Development: Leaders might be born, but leadership is also a skill that can be learned. Some people are placed in a leadership position without the necessary skills and experience and need to learn quickly. Lack of Support: Just as leaders offer support, they need it too. A network of mentors, advisors and other peers can help. Challenging Environment: Sometimes it’s not you, it’s them, like a chain of command that is laying blame everywhere but where it belongs. Personal Limitations: Then sometimes it is you, such as a fear of failure that limits your effectiveness, or a lack of confidence, which is key to successful leadership. Micromanaging: There’s a tendency to try and regain control by getting into managing the minutia of the team, but this can feel like meddling. Micromanaging can denote a lack of trust in your people and can backfire. Fail to Support: The opposite is that you pull back and don’t give your team the support they need to succeed. Unable to Make Decisions: For some, the frustration of those challenges can lead to inertia and a lack of being able to pull the trigger. A leader that can’t decide is not a true leader. Avoid Hard Conversations: Then there are those who avoid confrontation and don’t start the difficult, but necessary, conversations needed to get things back on track. Get Defensive: Some leaders get defensive. They take out their frustrations on others and refuse to listen objectively to constructive criticism. Clarify or Adjust Role: Never be too rigid. Sometimes the best response is to clarify what your role is, or simply adjust it to something that you’re more comfortable with. Embrace Feedback: Be open to listening to other points of view. They can lead to possible solutions you had not considered. Know What Value You Bring to the Table: Just by acknowledging your skills, strengths and expertise, you’ll add to your overall confidence, and that will positively impact your leadership. Create a Development Plan: Know your strengths, but also identify your weaknesses. That way you can make a comprehensive development plan. Set Goals: To structure that development, set goals for training, progress, etc. Role Play: This is a good technique for working through issues and finding solutions that might otherwise have been hidden. Set a Vision for Your Group: Part of motivating and inspiring the group is having a clear vision that has been communicated and understood by all. Delegate: Finally, you can’t do it alone. That’s not leadership; that’s being unrealistic and masochistic. Share responsibilities. You assembled a team because they have the skills and experience you wanted. Use them. Pro-Tip: As noted above, leaders are not necessarily born. Even if you came into this world with natural leadership qualities, you still can improve. Leaders aren’t complacent. Look for leadership training to bolster your skill sets and add to them. Today we’re talking about Leadership Challenges, plain and simple. Today I wanna talk about what the role of the leader is. I wanna talk about some of the challenges of the leader, the impacts that that has on the team in the organization, and how to adjust. So, at this moment in time if you Google “Leadership Challenges”, you’ll get results of almost 214 million results. 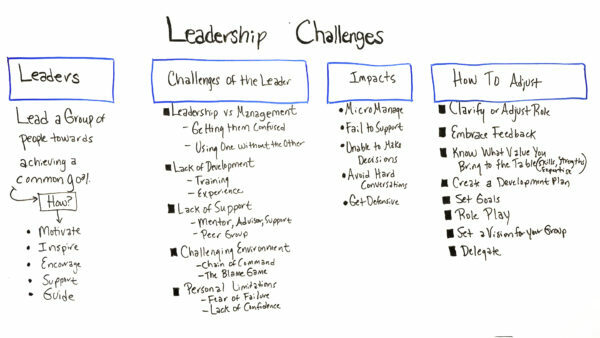 So, I would dare to say that most of us have challenges when we’re in the leadership role. But, let’s look at what a leader does. So, a leader leads a group of people towards achieving a common goal. Well, how do they do that? Well, they motivate, they inspire, encourage, support, and even guide. Well, some of the challenges of the leaders can look like this. Leadership versus management, you probably see the debate all the time, and people try to pit leadership versus management, like one is bad and the other one is good. But, what happens is sometimes people get those two confused, or maybe they use one without the other. I would submit in my experience, it takes both leadership and management. There’s also, at times, a lack of development. We’ve all been in the scenario where maybe we were promoted to a leadership role maybe we weren’t ready for, or maybe we leap to take that role when maybe we thought we could help. But sometimes there is a lack of training or experience for leadership. There are some specific skills that need to be…that are required, and experience helps as well. And then sometimes there’s just the lack of support, maybe lack of having a mentor, an advisor, or even any kind of support system you can go to for advice, and even peer groups. Some of my most valuable expertise and tips have come from my peers, and we get together, and we toss around ideas of things we’ve tried that worked, and things to beware of that didn’t work. Also, a challenge can be a challenging environment, where maybe there is a rigid chain of command that you have to follow, or even one where there’s the blame game where the leader gets blamed for everything, and it becomes like Pavlov’s dog where maybe someone is afraid to try anything because it yielded ill results. There’s also personal limitations. Sometimes we find ourselves maybe having the lack of training or experience. So, there’s that fear of failure. So, sometimes we can become paralyzed. And then there can just be a lack of confidence, maybe without enough experience. So, let’s look at some of the impacts that all of this can have on the team in the organization. In these scenarios, one can micromanage people within the organization or the team. They can also fail to support the team. Also, sometimes where there are critical decisions to be made, they’re just unable to make decisions. Also, avoiding hard conversations. Sometimes when you’re the leader of a team or a group they’re difficult, or discussions or conversations that have to be made, and so just avoiding those. Also, being defensive for feedback. Many times people, when we’re in that scenario, people want to give us advice or, you know, constructive criticism on how we can improve, or maybe give us some feedback on how our actions are impacting others. And then sometimes people get defensive with that. So, how can we adjust to all of this or this situation? Well, first of all, by clarifying or adjusting the role. Sometimes if you clarify, you know, what your span of control is over a group, or if you just don’t feel like you have the training or experience, then you can adjust the role to something that’s more comfortable. Also, embrace feedback. That’s one of the biggest gifts people can give us is feedback. So, just be open to embrace it and take it back and study and really look at where could they be right, and how could you improve something that you’re doing. Also, know what value you bring to the table. By knowing your skills, your strengths, your expertise, that lends a set of confidence even in itself, by knowing that you do bring value. Also, create a development plan. All of us are probably always working on trying to help develop ourselves. So, look at where your strengths are, and how to keep improving those, and maybe find some areas where you have gaps or weaknesses where you want to improve, and make a literal plan. Setting goals, ways to give yourself some training, give yourself some experience to develop. Also, role-playing. I find this very helpful in situations I find myself in. I find a colleague or a peer or mentor, someone that I can role-play. And so, I can see how the scenarios work out. Also, set a vision for your group. By having a common vision for your group, then everyone knows where you’re going. It’s very discerning to a lot of people if you’re the leader and they don’t really know where you’re going. So, by setting a common vision for the group and letting them know that they have a role there and why they’re so important. And then, delegate. Sometimes as a leader you just…you do need to delegate certain things off your plate to someone who is more equipped to do that or in a better position. So, if you need a tool or resources that can help you in your leadership role and try to avoid or mitigate some of that leadership challenges, then visit our website at ProjectManager.com. Management Styles: Which One’s Right for You?